Beau Wood scored a hat trick for the Bullseye. 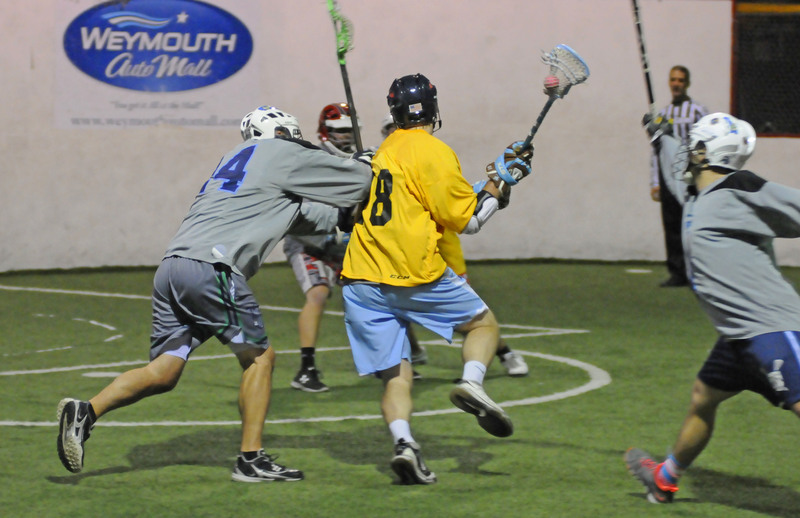 Facing a near must-win situation, the Minutemen broke the last of six ties with a three-goal run and then held off PrimeTime 14-13 in Dec. 4 Boston Box Lacrosse League action at South Shore Sports Center in Hingham. The win means the two teams have split their season series, allowing the Minutemen to control their own destiny as they have one regular season game remaining against each team in the league; a loss would have given PrimeTime a big edge in the playoff hunt down the stretch. Instead, the Minutemen and PrimeTime will look to slug it out for the last two playoff spots as the MegaWhales two-game win streak was snapped 15-8 by Bullseye. The Minutemen-PrimeTime contest went back and forth the entire night, with the Minutemen showing a balanced attack on goals from Ryan Murphy, Will Jennings, Rob Murray and Ed Doherty in racing out to a 4-1 lead. From there, however, PrimeTime tied the contest on scores from Alex Zomerfeld, Alex Bunick and Spencer Low. Two quick responses from Jennings and Murphy were answered in short order by Zomerfeld and Henry Archie, and the teams traded goals until Brendan Grant’s first score of the night gave PrimeTime its first lead at 8-7. Rob Murray’s goal with 49 seconds left in the half knotted things up at the break. He scored his fourth of the night to open the second stanza and give the Minutemen another lead. Again, the scoring went back-and forth, with the game tied at 10 and then 11 before Nick Black, Murphy and Jennings hit three times in just under two minutes to create a 14-11 advantage. Late scores from Grant and Zomerfeld gave the Minutemen opportunities in the last minute of play but Andrew Forrester turned aside the game’s final salvos to preserve the win. Murray led the way for the Minutemen with four goals and an assist, and Jennings had six points (3-3) on the night. Murphy finished with a hat trick and Doherty, Black and Pat O’Loughlin had multi-point nights in the win. For PrimeTime, Zomerfeld and Grant both had a hat trick plus one helper, while Nick Samson, Jason Wellemeyer and Bunick each contributed a goal plus two assists. In the night’s first game, Bullseye continued a pattern of allowing opponents to stick around and even have a lead for the first 10 to 12 minutes of the game, only to finish the first half with a flourish. In this case, the MegaWhales were leading 4-3 after 10 minutes only to see Bullseye score six straight goals and eight of nine before halftime. Kyle Smith scored a hat trick and Adam Fishman twice during the run. The second half saw more end-to-end action and less scoring, but Bullseye used a stifling defense – 70 loose balls and 15 caused turnovers compared to 53 and seven for the MegaWhales – to control the tempo and never let the MegaWhales threaten again. Will Walker led the way for Bullseye with four goals and an assist, Beau Wood and Smith contributed hat tricks and Fishman, John Uppgren and Jack Korzelius had multi-point nights; Chuck Jaffe backstopped the win with 22 saves. For the MegaWhales, Dan Hettler, Carl Walrath and Eric Swanson all had multi-point nights, while Chris Hettler stopped 33 shots in taking the loss. The Minutemen’s win sets up an intriguing stretch run for the season, as the team has split its games with both PrimeTime and the MegaWhales. The Minutemen are buoyed now by a win over the Blazers – otherwise they would be tied with Prime Time and MegaWhales in the standings with two wins – but the playoff race is set up for some excitement down the stretch of the season. That season continues next week as the BBLL reaches the two-thirds point in the regular season as PrimeTime squares off with Bullseye at 9, followed by the MegaWhales and the Blazers at 10.